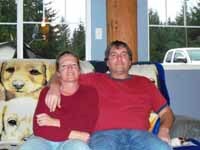 Bruce and Sheila live on the beautiful west coast of British Columbia, Canada. Bruce has been dreaming of living in the sun for the winters since he was 20 years old. He and Sheila have been married for 25 years and their kids are grown. They started traveling 4 years ago looking for the right place to live. Last winter they went to Costa Rica for 4 weeks, rented a car and traveled from the west coast to east coast to the volcano and met the friendliest and most helpful people in their travels. That's when they decided to buy some property. They stayed at the guest house and Marcel took them out to look at lots the first day, the second day Patrick drove them to houses under construction to completed houses. Bruce said "They wined and dined us and the best part of the stay was I never heard the words buy or sell all the time we were there. Needless to say we come home owning a piece of paradise, now I can't wait to build a house and start enjoying the warm winters."